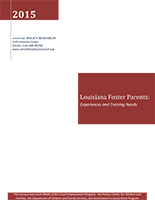 This document draws on data from several different sources to explore the experiences of Louisiana foster parents. The primary goal is to identify areas in which foster parents need additional training and support. A brief demographic profile of the foster parents who were interviewed or surveyed is included, as is a brief overview of their experiences as foster parents. This information is intended to put into context the voices that are being heard.